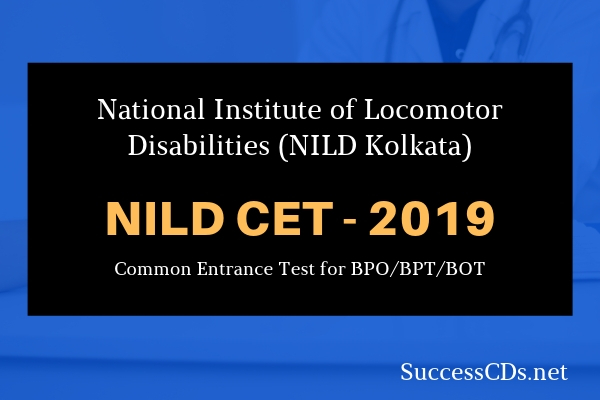 NILD CET 2019 - National Institute of Locomotor Disabilities Common Entrance Test acronym as NILD CET is conducted by the National Institute of Locomotor Disabilities for admission to various Undergraduate Courses at NILD (Kolkata), SVNIRTAR (Cuttack) and NIEPMD (Chennai). Applicants can read all the necessary details regarding NILD CET 2019 such as application form, eligibility criteria, admit card, result, selection process etc. on this page. The admission to various Bachelor Courses for the academic year 2019 offered by NILD, SVNIRTAR, & NIEPMD will be done as per the application and admission procedure detailed in this bulletin. The candidate should be an Indian National. The admission will exclusively be on the basis of merit in the Common Entrance Test (CET-2019). Last date of receipt of Application Form or closing of online submission: 24th May 2019 till 5 P.M.
Only those candidates who are born between 01st January 1999 and 31st December 2002 (inclusive of both dates) are eligible. For SC, ST & PH category candidates, the candidate should be born between 01st January 1994 and 31st December 2002 (inclusive of both dates). Date of birth as recorded in the Matriculation Certificate /Secondary Education Board Certificate (Class X) will be treated as authentic. Candidates must produce original certificate for proof of age at the time of counselling, failing which they will be disqualified. BPO (4 years + 6 months): 10+2 (Higher/Senior Secondary Examination) I.Sc. or equivalent- recognized examination with subjects Physics (P), Chemistry (C), Biology(B) or Mathematics (M) and English with minimum aggregate of 50% in PCB/PCM when taken together for General/OBC and 40% for SC/ST & PH candidates. BPT (4 years + 6 months): 10+2 (Higher/Senior Secondary Exam) I.Sc. or equivalent- recognized exam with subjects Physics (P), Chemistry (C), Biology(B) and English with minimum aggregate of 50% in PCB when taken together for General/OBC and 40% for SC/ST & PH candidates. BOT [4 years + 6 months]: 10+2 (Higher/Senior Secondary Examination) I.Sc. or equivalent- recognized exam with subjects-Physics (P), Chemistry (C), Biology (B) (Botany and Zoology) and English. BPT [4 years + 6 months]: 10+2 (Higher/Senior Secondary Examination) I.Sc. or equivalent- recognized exam with subjects-Physics (P), Chemistry (C), Biology (B) (Botany and Zoology) and English. BPO [4 years + 6 months]: A candidate who has passed 10+2 in science or equivalent with Physics (P), Chemistry (C), Biology (B)/Mathematics (M) with minimum 50% in PCB/PCM and other test will be eligible. For SC/ST and PH candidates, the minimum mark should be 40% and 45% respectively. BOT [4 years + 6 months]: Passed the qualifying 12th standard/I.Sc. or equivalent exam having English as a subject and a minimum of 50%in science with Physics (P), Chemistry (C), Biology(B) as mandatory subjects. For SC/ST and PH candidates, the minimum mark should be 40% and 45% respectively. BPT [4 years + 6 months]: Passed the qualifying 12th standard/I.Sc. or equivalent exam having English as a subject and a minimum of 50%in science with Physics (P), Chemistry (C), Biology(B) as mandatory subjects. For SC/ST and PH candidates, the minimum mark should be 40% and 45% respectively. Date of Examination 09th June 2019 (Sunday) 11.00 A.M. The Entrance Test will be of 2 hours (120 minutes) duration. Questions will be multiple choices objective type of 10+2 Science standard. The entrance test shall have one paper consisting of two parts. There will be 100 multiple choices objective type questions of one mark each. More than one option answered against a question will be deemed as incorrect. Any question not attempted shall be awarded ZERO marks. The candidates can opt any three centres as per their convenience. Normally the candidates are allotted the centre of first choice; however, it can be changed at the discretion of the competent authority. The request for change of centres will not be considered. For NILD, one seats each in BPT, BOT & BPO is reserved for J&K. For NILD & SVNIRTAR, 2 seats each in BPT & BOT and 1 seat in BPO, For NIEPMD 2 seat each in BPT & BOT are reserved for North Eastern State. CET 2019 results will be published on Common rank as well as for PwD, J&K, NE Rank. Candidates who get reservation form PwD Rank, J&K, NE Rank, the seat will be deducted from the candidate’s category (Gen/SC/ST/OBC). Merit list/ Waiting list will be generated on the basis of marks obtained in the Common Entrance Test-2019. The result and schedule of counselling will be available on the websites www.niohkol.nic.in by stipulated date. The candidates are advised to appear for counselling based on result published on website. Payment may be done either online or offline. For offline payment, a Demand Draft of Rs.750/- for General/OBC/NE/J&K & Rs.600/- for SC/ST & PwD candidates should be sent along with the duly filled downloaded form in favour of "National Institute for Orthopaedically Handicapped" payable at Kolkata. Offline Payment: Through Demand Draft to be made in favour of “National Institute for Orthopaedically Handicapped” payable at KOLKATA.